With a new year usually comes a lot of self-talk about what will be done differently, blank slates, empty pages, starting over, and the like. So I'm going to share my favorite posts about organizing art studios! My studio tends to maintain a certain amount of chaos. 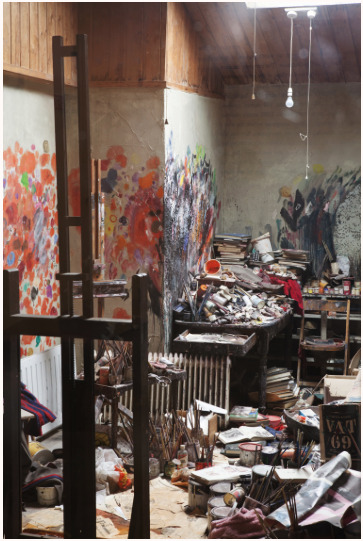 Painter Francis Bacon said that the chaos within his studio fed into his work, and there are many a post (like this one) that suggest the most creative minds keep their spaces visually cluttered. So for years I embraced my inner Francis Bacon...really until I met my photographer husband and we HAD to share a studio. He moved down from New York and was settling into our new home together. I had already set up the largest bedroom in the house to be my painting studio, and it was admittedly "painterly", paint all over the walls, the ceiling, the floor, random scraps of paper debris from my sculptural collages. My house organization wasn't much better. Sure, I could multi-task like a wizard, but many times I didn't slow down enough to put things back where they came from after the work was done. So it turns out this behavior was something that was both my creative ally, for there was no lack in wanting to take action, but perhaps the reason why so many things in my life didn't feel complete. If we consider each action we take as a circle, remembering to complete the circle is an important part of living both a healthy AND creative life. I hope you find them inspiring as well. HAPPY NEW YEAR!